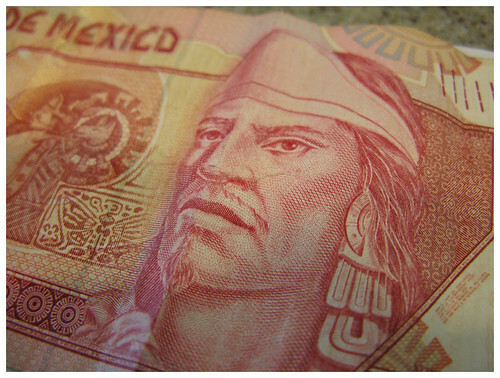 After narrowly scraping in under budget in Mexico, I was expecting Guatemala to be a hell of a lot cheaper. In many ways it was – thanks to cheap chicken buses and short distances, I spent less than a fifth of what I had in Mexico on transport; similarly I was pleased to find that accommodation was much cheaper too. Despite that, I still ended up far closer to my limit than I’d hoped, which is something I should have foreseen, for one main reason: my Spanish lessons. Coming in at $400 for two weeks, it accounted for 41% of my total spend and bumped my daily average up by nearly $20 per day. It was all worth it though, as it was the most fun I had in the country, and already it’s really helped me with my communication ever since. The other surprise factor which is bound to affect any true Brit’s spending is the fact that beer is twice the price of that in Mexico. Now Gallo (the standard lager) and Moza (the delicious dark one) are good enough, but not really worth twice the price. Apparently the reason it’s so expensive is that the rich who dominate Guatemalan politics have ensured that income tax rates are among the lowest in the Americas, meaning the shortfall has to be made up with consumption taxes, which certainly hit the tourist harder. Next stop: Honduras. 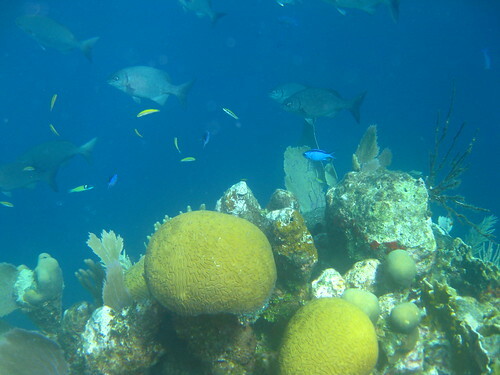 And diving. Which is expensive. 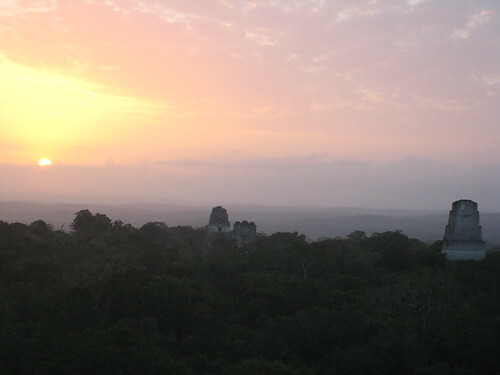 My first trip to Guatemala in 2007 was extremely brief – I spent just two days there on a brief visit from Mexico to see the Mayan city of Tikal – but it remains probably my best travelling memory. Tikal is the most amazing place I’ve visited, and viewing the sun rise over the jungle from the top of Temple IV was an experience that truly merits using the travelling cliche of ‘magical’. That brief stop made me hungry to go back and see more, which is why I made it my second stop after Mexico. 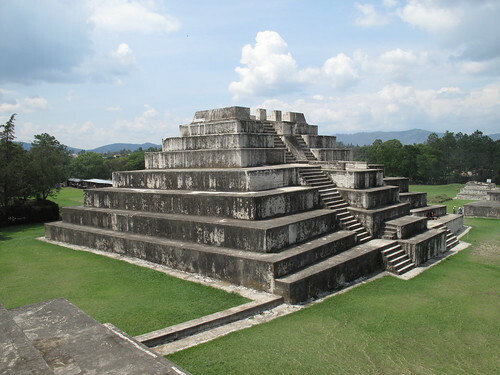 This experience was a very different one to the first – Tikal is in the remote, sparsely-populated Peten region of Northern Guatemala, whereas this time I spent my entire time in the highlands further south, where the majority of the population live. 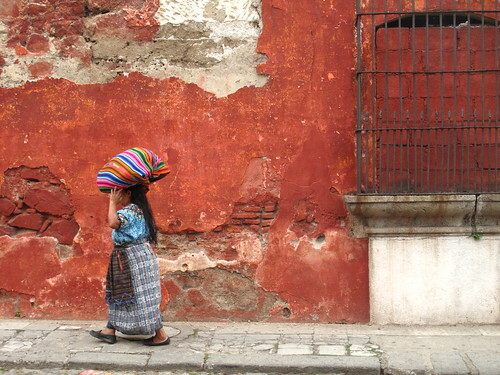 In many ways Guatemala has a lot of similarities with Mexico, especially the southern state of Chiapas (both share a high indigenous Mayan population). The food is pretty similar – lots of tortillas, rice and beans, although the quality and variety of streetfood was nowhere near as good as Mexico, and the chili sauces disappointingly mild. The volcanic landscape of the highlands in many places looks similar to Mexico. The Spanish colonial cities share similar histories and architecture (in particular Antigua looks very like San Cristobal de las Casas). In other ways the two countries are very different. The indigenous population of Mexico is very much in the minority, whereas Guatemala has the highest indigenous population of any country in the Americas, and it’s very noticeable (one of the plus sides to this for me was that Guatemala is the first place in the world I’ve ever felt tall, which is saying something). 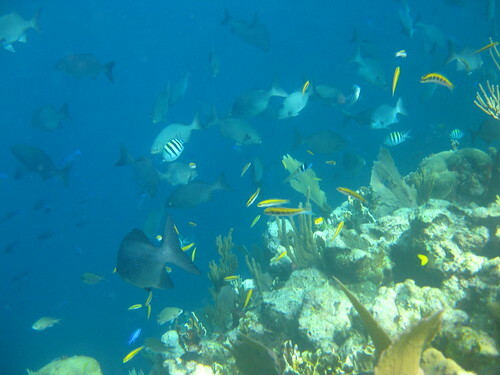 Probably the biggest difference for me was the number of other tourists – after swine flu and the drugs war kept Mexico pretty gringo-free, it was a shock to the system to visit somewhere where there were so many. My first stop was Huehue, the closest big city to the border withe Mexico. It was instantly obvious that the city was much poorer than anywhere I’d experienced so far, and one symptom of that was that when we went looking for a bar to have a relaxing drink after a hard day of traveling, we were amazed to find there is only one in the entire centre. 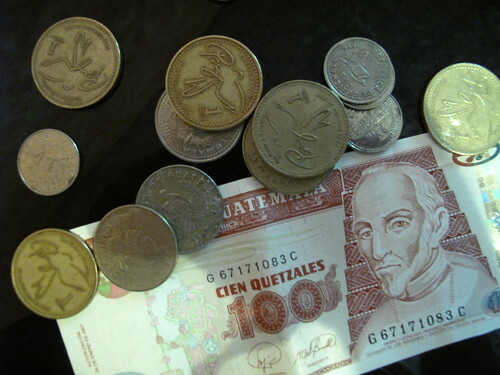 Which was obscenely expensive – which came as a surprise, seeing as I’d expected Guatemala to be cheaper than Mexico. In fact, it generally is, the biggest difference being that beer and other alcohol is generally double the price of its northern neighbour. The other expensive thing in our time there was our visit to the Mayan ruins of Zaculeu – worth a visit because the restoration carried out by the United Fruit Company in the 1950s actually makes them look far closer to how pyramids would have looked originally than in other sites with more sensitive restoration – but which were more than double the cost to visit of any of the far more impressive ruins in Mexico. 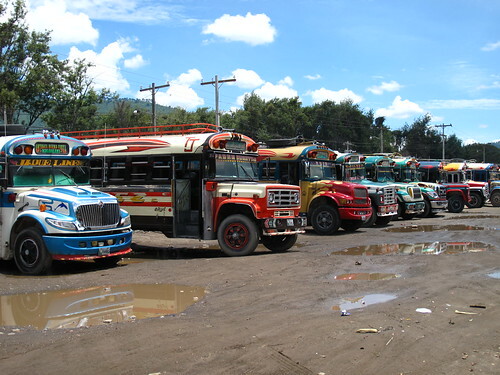 Getting from Huehue to Xela was pretty cool, as it was my first experience of the legendary chicken buses, old US yellow school buses that have been shipped down south, painted in glorious technicolor patterns and put to service plying the steep and winding highways of Guatemala. I loved Xela too – my first impressions weren’t that great, but over the couple of weeks I got to spend there I fell in love with the place. There were very few tourists there, instead most of the foreigners there are language students, giving the town a bit of a college town feel. One of the other great things about the town, unlike the places I would visit later, is that ther gringos don’t hang out in gringo ghetto bars, instead everywhere I went had a good mix of Guatemaltecos and foreign students (most noticeably at Bar Rumba, where it was always entertaining to watch the locals salsa-ing away expertly while most of us foreigners spent more time tripping over our feet trying to copy them). It’s also a great city to base yourself for a while, as there’s loads to do nearby, including the volcanic hot springs of the Fuentes Georginas (the water was so hot it was like being in a bath), and treks to the variosu nearby volcanoes. Probably most interesting of all was getting to visit the nearby market of San Francisco el Alto, the largest market in Central America. 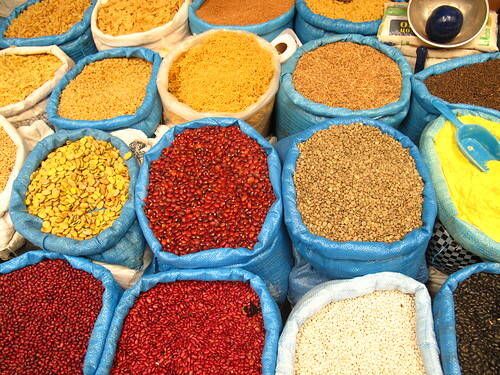 Unlike the more famous market of Chichichastenango, which specialises in artsenias and therefore is quite a tourist magnet, this market is very much a general market, selling pretty much everything under the sun in stalls crammed into the narrow winding lanes of this mountain town. Highlight for me was the main square at the highest point in the town, where locals were selling sheep, goats, pigs, turkeys, cows, dogs, cats and geese, none of them kept in pens, giving the place quite a chatoic feel. 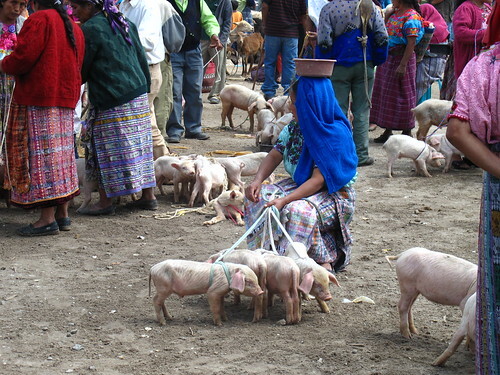 It was quite and impressive sight watching little old indigenous women struggling to wrestle a newly purchased (and very reluctant piglet) into a bag to take home. 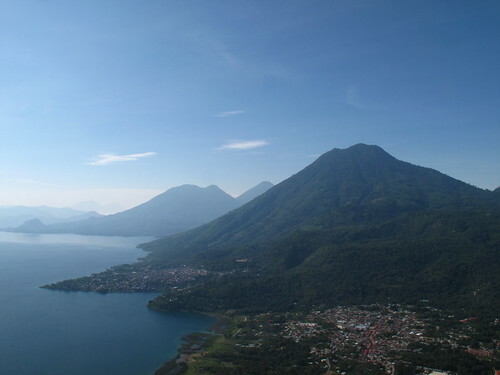 There’s no other way to describe it, Lake Atitlan is simply stunning. High up in the western highlands, the lake is completely surrounded by high mountains and extinct volcanoes, with pretty little villages, each with a different character clinging to the sides. Being this beautiful, it’s no surprise that bit’s very much a tourist magnet – in fact I saw more tourists around the lake than I had anywhere so far in my trip. I stayed in San Pedro la Laguna, the backpacker village (others include Panajechal, the most touristy; San Marcos, full of new age types and therefore the best place to go if your aura needs a good cleaning ro you have wonky chakras that need aligning; and Santiago Atitlan, the most indigenous of all the villages), and spent a very pleasant few days, chilling by the lake, kayaking across it to San Marcos and back, and hiking up the Nariz de Indio (Indian’s nose), which gave spectacular views across to the volcanoes and over the lake. 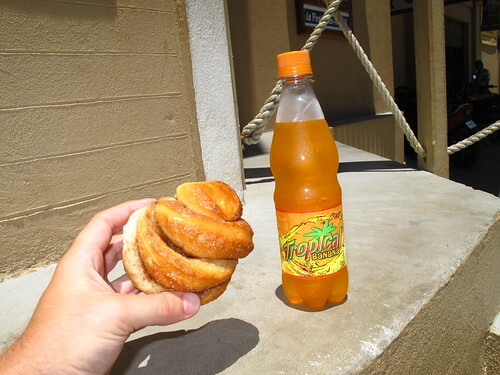 Antigua is a very different place to the rest of the country. 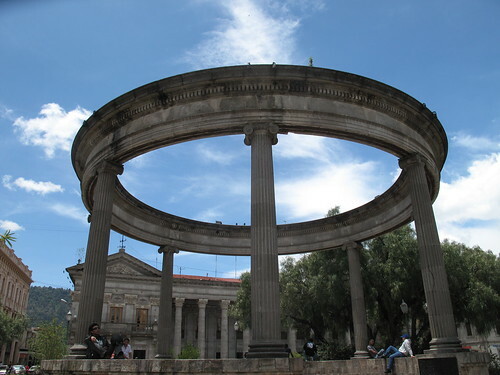 It was the colonial capital until late in the 18th century when a series of earthquakes nearly destroyed the city. Now, most of the colonial buildings have been restored and are painted in bright colours; meanwhile many of the huge former convents and churches still lie in impressively ruined states dotted around the city. As the obvious tourist highlight of the country, the government has ensured the city is cleaner and safer than the rest of the country – it’s been said that this is what Guatemala would be like if it was run by the Swiss. I must admit that despite its stunning beauty, I didn’t enjoy it as much as I had the colonial cities of Mexico, mainly because the city seems to be mainly populated by foreigners, giving it quite an un-Guatemalan feel compared to Xela. Don’t let that put you off though – I think I’ve just been spoilt by elsewhere. One of the best things about the country is that so much is crammed into such a relatively small space (the whole country is about the size of England), and if any of you back home are jealous of my travels, Guatemala would make a pretty perfect place to take a two-week holiday, as in that time you could see one of the best preserved colonial cities in the Americas, see one of the world’s most beautiful lakes, hike active volcanoes, get to see amazing ruins, as well as seeing how the descedents of the Mayans who built them still have a traditional culture that’s very much alive to this day. 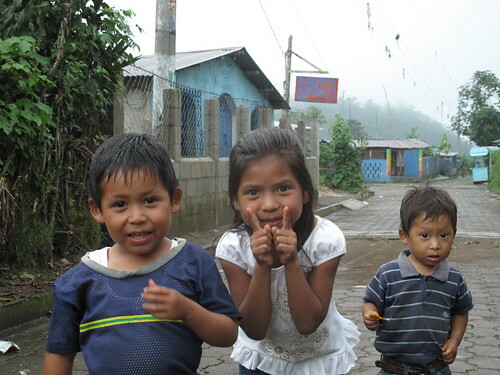 You can read any of my posts about Guatemala here and see all my photos from the country here. 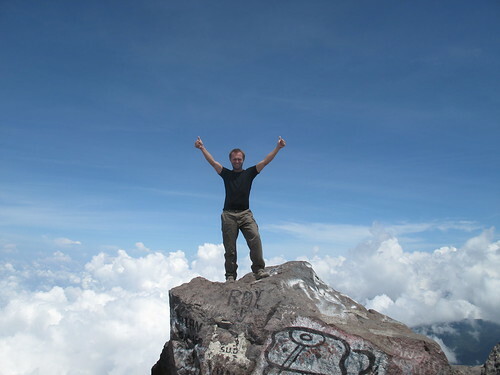 If there was an active volcano in the UK, you wouldn’t be allowed within a mile of it, let alone be able to climb it. So when I found out that Antigua had one on its doorstep, that you could not only climb but also get really close to the lava, I didn’t have to think twice. I wasn’t going to let anything put me off, even the fact that so far I’d met two people who’d climbed it, and both had manage to injure themselves – both by slipping on the loose rock and cutting their legs on the very jagged rocks, one of whom so badly that he needed stitches. I’m very glad I met them though, as they both advised me not to ignore the little kids who hang around at the bottom waiting to meet climbers so they can hire them sticks for a very reasonable price, which are very handy for providing an extra means of support. I’m becoming increasingly accustomed to early starts (I think I’ve been up at 6am or earlier more times the last few months than I have done in years), so it was no surprise that we had to be picked up at 6am, to make it up the mountain before the rains came, and after a couple of hours’ driving we found ourselves at the foot of the trail. After the extreme exertion of climbing Volcan Santa Maria in Xela, I was hoping for an easier ride this time round, and I was not disappointed. The trail wasn’t too steep at all compared to my previous experience, and it took far less time, as the volcano itself is much smaller (being relatively young). We were lucky enough to be in quite a small group, and all of relatively similar fitness, so we made it up through the treelined lower slopes of the volcano pretty quickly and soon emerged at the dried lava fields that surround the active vent. That’s where the tricky bit begins – the dried-out lava is extremely sharp, and very very uneven. Much of it is in the form of loose rocks, meaning your footing is likely to give way at any moment, and I could quite see how my friends had managed to injure themselves. So we very carefully made our way across the path towards the vent, being very glad of the sticks we’ds hired at the bottom (especially when we saw a German woman fall, cutting her leg so badly she couldn’t walk any more and had to wait for a horse to make its way up the mountain to carry her back down. 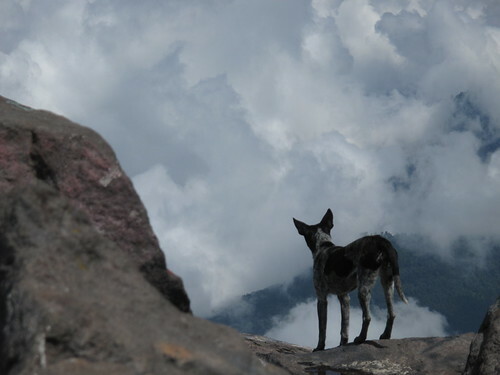 Others had less trouble, most notably being the local dog that appeared to live on the mountain (and whose fur had taken on a really golden-orange colour, presumably from all the sulphur in the air). 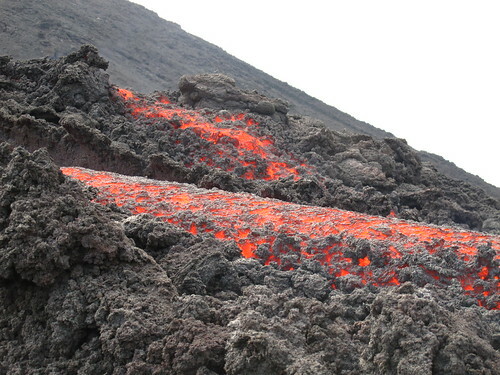 The lava runs in various pipes close to the surface, and has several vents, so having a guide to make sure you don’t end up walking in the wrong place was crucial – as it is, in several places you could feel the heat on the rocks as you leant on them, knowing fresh lava was running just beneath. 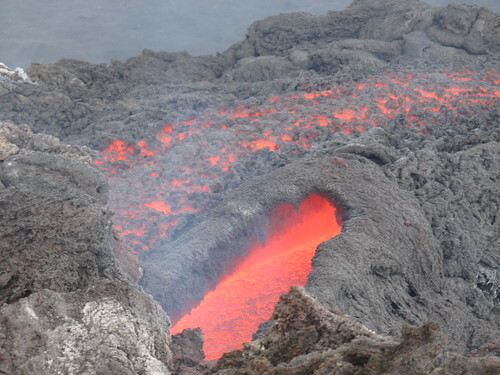 Finally we made it to the main lava flow – and it certainly wasn’t a disappointment. Watching red hot molten lave running down the hillside just a couple of feet away from me was truly one of the most spectacular things I’ve ever felt. It was also one of the hottes, unsurprisingly enough. We were lucky enough most of the time to have the wind behind us; on a couple of occasions it turned to blow towards us and it was like standing in a furnace. The final ascent (which took a bit of queueing) took us up to see the vents themselves – right next to each other, two openings in the ground where the lava pour out of the ground. 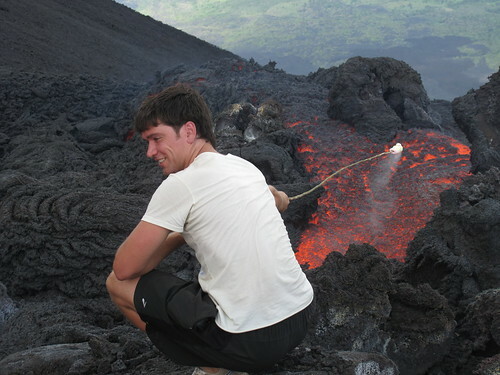 The lava is so hot that there were people toasting marshmallows over it – and it took just a couple of seconds for them to blacken, and that’s with the stick a few feet away. Experiences like these are really one of the reason I love travelling – I could never do anything like that back home, and it’s given me a memory I’ll never forget. 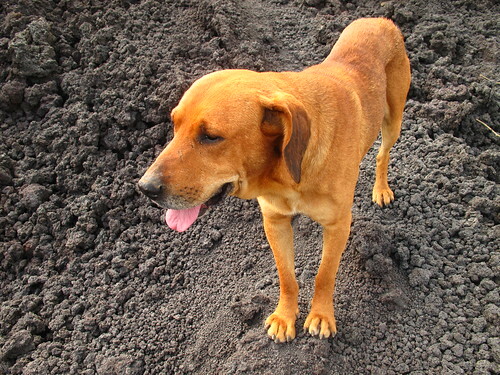 You can see all of my photos of Volcan Pacaya and the beautiful colonial city of Antigua here. After weeks of being massively behind on my blogging, it turns out all it takes to catch up is being in a city where it’s too dangerous to even go 50m from the hotel without being mugged once it gets dark (that’s Bogota, Colombia, by the way). Anyway, I’ve now got all my photos uploaded to Flickr and I’ve written all my blog posts about Guatemala, Honduras & Miami. They’ll be appearing over the next few days, but in the meantime, thanks to popular demand (well, one request from my friend Will, actually) I’ve now added a page with a map showing where I’ve been so far, as well as links to all the photos and posts to date, and a rough itinerary of where I’ll be heading next. Time will tell whether or not I actually manage to keep it up to date, but at the moment it seems like a good idea. After spending a week studying Spanish in Xela, I made a last minute decision to switch to PLQ’s sister school up in the mountains. It hadn’t been part of my original plans, but on speaking to some of the students who’d studied there it really sounded like an experience not to be missed, and so was very glad to find last minute places available. La Escuela de las Montañas (the Mountain School) is situated about 10km north of Xela, in the surrounding highlands, one of the finest coffee-growing regions in the world, although it takes an hour to get there because of the winding roads that lead up into the mountains. It very much shares the same philosophy as its sister school, but the key difference is it’s actually situated right next door the communities it helps, meaning you really get a better understanding of Guatemalan village life that most travellers probably don’t get to see. 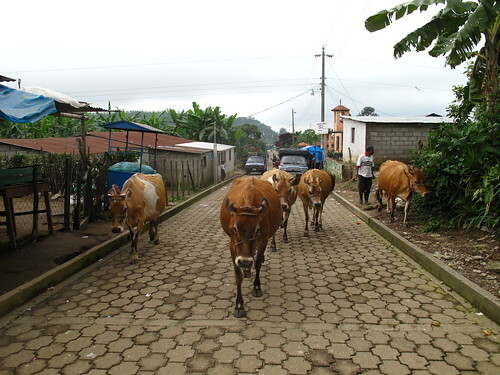 The neighbouring communities of Fatima and Nuevo San Jose are both made up of families who formerly lived and worked on nearby coffee fincas. After the collapse of world coffee prices in the 90s, the owners of the fincas simply stopped paying the workers for two years. The situation got so desperate that eventually children died of malnutrition, and the children missed out on school for the whole time as well. In both cases the workers took the owners to court, and won. In one case, they eventually got some of the money they were owed after this; in the other the owners still failed to pay up, and in frustration the community eventually took the owner hostage until he paid up. With the money they gained, they were able to buy some land and build houses. However the situation is still pretty desperate, with very few of the people in both communities having regular jobs – instead most of the men get up at 4am every morning to get a bus into town to look for casual work, which is by no means guaranteed. What work there is is often well below the minimum wage (which is very hard to enforce in Guatemala). So the mountain school was set up to teach Spanish and use the profits to help out both communities financially, both by paying families to provide meals for students, and by providing funding for the communities’ special projects fund. At the moment, they are also trying to find the funds to help build a library and computer centre for the children of both communities, to help their education, something which is expensive for families with very little money. 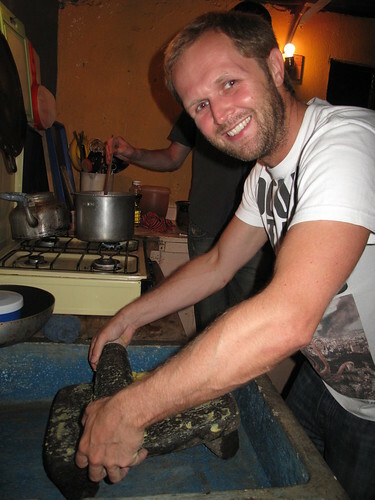 It’s a rather over-used word, but eating three meals a day with my host family was quite a humbling experience – after staying with a middle class family in Xela with a big house, it was quite a contrast to be eating in a tiny dirt-floored shack made of corrugated metal, just one pretty small room divided by a curtain, serving as a home for a whole family, with the bed in one half and the cooking area in the other. There’s no electricity, running water or toilet in the house – those are all shared with other neighbours, and cooking is simply on a makeshift wood-burning stove. Despite these difficulties, I actually ate more and better than I had with my family in Xela, and every breakfast I was entertained by Jessica, the family’s two year old daughter who chatted away to me in incomprehensible Spanish while I ate. Everyone in the village is incredibly friendly too – with up to fourteen foreign students turning up every week, and only around forty families in both communities, they are quite used to our strange ways, and the kids are always running up to you demanding you take a photo of them (which they always love seeing), or even just to stop and play games or dance in the street with them. The school itself is a little oasis of calm – the main building (where we all sleep) is surrounded by a huge garden, containing banana and coffee trees, a traditional medicinal herb garden and a carp pond. 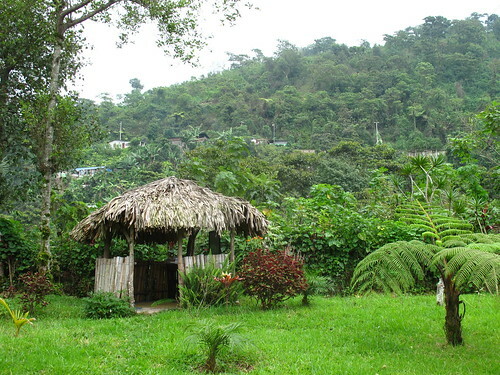 All lessons also take place in little palm-thatched cabañas in the garden, which is a lovely way to study (if there is such a thing as a lovely way to study). There’s also a little mirador (look-out), where you can sit and read, or study, or just chill out, overlooking the valley and the adjacent mountains. The terrace of the school also has hammocks for relaxing too, and there’s a kitchen as well just in case you are still hungry (or you can do what we did and get a friend to visit from Xela with pizza). Being in such small place, there’s little to do of an evening but chill out, chat, and play cards outside over a beer or two, listening to the rain and watching the skies light up with the tremendous electrical storms that happen every evening at this time of year. The house also has two lovely cats and three adorable dogs guarding the place (they bark at every passing vehicle, but unfortunately living in a humid and rainy climate they are bit too smelly – despite regular baths – to really play with). As well as all the classes, you also get more of a feel for the community by the various other talks the school organises – one night the village midwife came to give us a talk about how she works, and the difficulties she faces, one lunchtime we had a talk from a local who is involved in running the local community radio station that has a crucial role in providing information about health and education, and most fun of all was the night one the local mothers came down to teach us how to make platanos rellenos (stuffed bananas), which involved boiling up bananas until soft, mashing them up to make a dough, rolling them out to make banana tortillas, and then stuffing them with pureed sweetened black beans, and then deep-frying the whole thing and serving with sugar – great fun and absolutely delicious. The whole thing has been a magical time, so relaxing and enjoyable I barely feel like I’ve been studying, and getting the chance to experience at close hand the realities of how the majority of Guatemalans live is something I’ll never forget. It’s a shame I have to get on because I’d love to stay here for several weeks, slowly improving my Spanish (many students do just that). 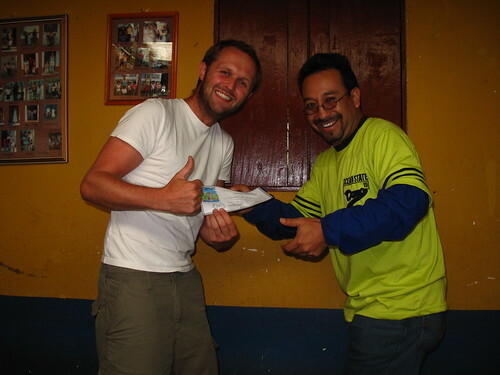 If you’re thinking of studying Spanish in Latin America, I really can’t recommend this place highly enough (you can find out more about it here), I genuinely can’t think of a better place to do it, plus you get the chance to help an extremely poor community. I got my first reminder that I was staying in hotspot of geological activity when my whole classroom began to shake in a little tremor one afternoon. It was just a small one, but getting to feel my first earthquake was a pretty cool experience. There’s been a couple of others since I’ve been here (and that’s in just two weeks), but I slept through both of those (one time when I’ve been a bit annoyed I’m such a heavy sleeper). Getting to feel the earth move was a lucky experience, and one that made me all the keener to see the source of all the action – the local volcanoes. Not far from the city sits the dormant volcano of Santa Maria, which last erupted at the start of the last century, covering the city in mounds of volcanic ash, and which sits at 3,772 metres, towering over the city. 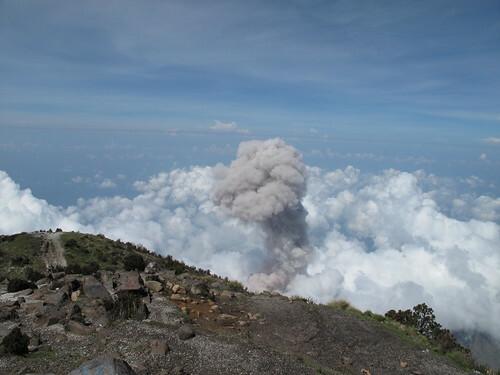 There appears to be little chance of it erupting again, as a new vent has opened up just the south, forming the newer Volcano of Santiaguito, which is in a state of near constant eruption, regularly belching out big clouds of smoke. So one Saturday I found myself getting up at the ungodly hour of 5am to hike up to the top. I’ve done a fair bit of hiking in the past, but going up a volcano was quite a different challenge – it’s not technically difficult, but it’s shape means it’s one long, even, steep climb all the way from bottom to top, with the added effect of the high altitude making it all the tougher – in fact I’d say it was the toughest hike I’ve ever done in times of energy (but all good practice for the hiking I’ll be doing to 5,000 metres and above in Peru & Bolivia this summer). We hired a guide, but it turned out we could have probably not bothered – as two dogs from the village at the bottom were waiting for us on arrival, who then spent the morning showing us the way, always running just ahead of us (with the occasional rabbit-hunting trip to the side), all the way to the top. 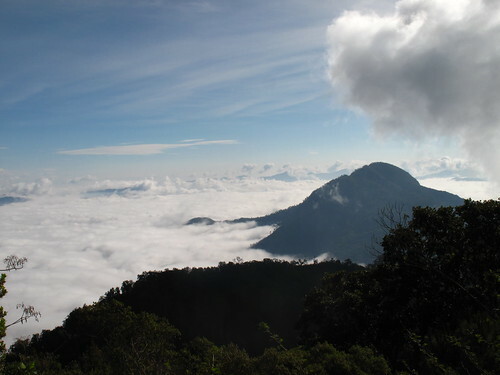 The early start is basically so that you can get to the top and back down again before the inevitable rainy-season clouds gather in early afternoon, and it was certainly a good decision. After all that hiking through the trees on the way up, it was spectacular to finally emerge above the treeline just short of the summit, and despite the fact that Santiaguito was covered by clouds, the views from the top were breathtaking. As if to make up for the fact I couldn’t see it, Santiaguito also kindly obliged by staging a little mini eruption for me just as I made it to the top, sending a column of brown smoke soaring above the clouds. Standing at the top looking down on the city and valleys and clouds far below was truly incredible and made every step of the slow climb up worth it. After a long, slow (it’s tough going down such steep slopes when they are steep, muddy, wet and slippery) descent I arrive back in Xela with pretty sore feet, but it’s made me pretty determined to complete the volcano experience by tackling the very active Volcan Pacaya near Antigua, where you can walk right up to fresh lava flows. As soon as I read about PLQE (Proyecto Linguistico Quetzalteco de Español) I knew it was the school for me. It has a philosophy that surrounds the learning of Spanish with developing an understanding of the social, economic and political situation of modern Guatemala, which really appeals to an old lefty like me. 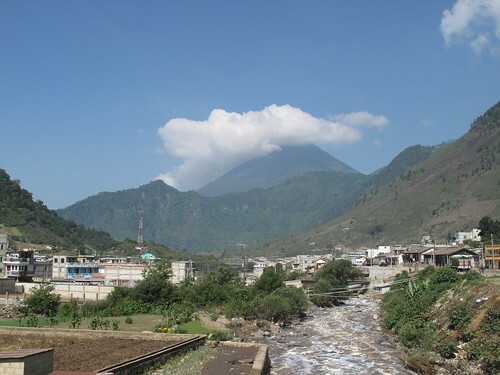 It’s run as a worker’s cooperative, meaning that the teachers are the best paid in Xela (as the locals call Quetzaltenango, Guatemala’s second city). A portion of the fees also goes to support various good causes in and around the city, and the opportunity exists to volunteer at some of these too. It’s probably not everyone’s cup of tea (I know I’ve bored many a person in the past when talking politics), but I found it fascinating. The week starts off with a lecture about the (very sad) history of Guatemala – covering first the oppression of the indigenous peoples by the Spanish conquistadores, followed by continuing exploitation by the rich landowners (which they defended by declaring independence from Spain before they could abolish slavery), right through to the thirty year long civil war that saw various leftist guerilla groups fighting for a better deal for the vast majority of the population. The war has been over for a decade now after the government negotiated for peace, but the dreadful situation continues – a tiny elite of around twenty families still controls the economy, and despite Guatemala being richer than its Central American neighbours, thanks to the extreme inequalities the majority of the population are the poorest in the Americas after Haiti (and most of those poor are the indigenous peoples, descendents of the Maya, who make up over 60% of the population, also the biggest proportion in the Americas). Aside from all the problems caused for the people of Guatemals by their ruling elite, the country also gets a pretty raw deal from nature, what with more active volcanoes than any other Central American country, earthquakes that three times devasted the original capital and in recent years have killed thousands of people, and yearly hurricanes coming in from both coasts that have frequently wreaked devastation. It’s been nearly thirteen years since I was back in class, and the whole process was shattering, especially as my lessons were from 2-7pm every afternoon – thinking that hard for that long really drains you, but it was worth it every time I made a breakthrough. Sadly the tiredness wasn’t helped by the fact I was almost permanently hungry. Part of the immersion experience is that you live with a host family for a week, who provide a bed and a desk, and three meals a day. Unfortunately for me, the food was very basic indeed, and in pretty small portions – I’m fully aware that Guatemala is a lot poorer than my own country, and I certainly wasn’t expecting gourmet food, but just speaking to other students at the school, I soon realised I’d drawn the short straw and got a host mum who just wasn’t a great cook sadly. I could have asked to be moved, but they were a lovely family so I just topped up with stops at the lovely local panaderia (and the occasional trip to McDonald’s – don’t tell my teachers that, they wouldn’t approve). The school’s philosophy attracts a really cool crowd of students too, in my week all from the US or Canada apart from me, which made the experience really fun too. Xela is a fantastic city to study in too – very few tourists visit the city (unlike much of the rest of the country), despite it being the country’s second-biggest city. 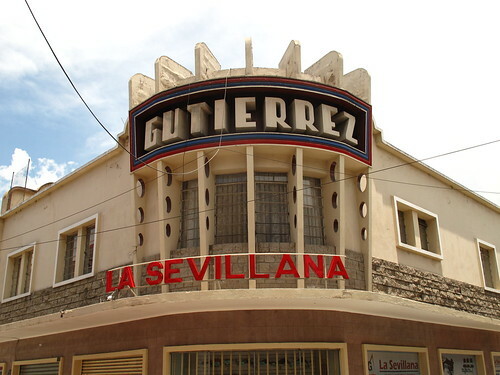 It’s not the most obviously beautiful city, but the more time I spent there the more I fell in love with the place, it has a really friendly atmosphere, and it’s much easier to meet and mix with Guatemalans than in some of the other places I visited. 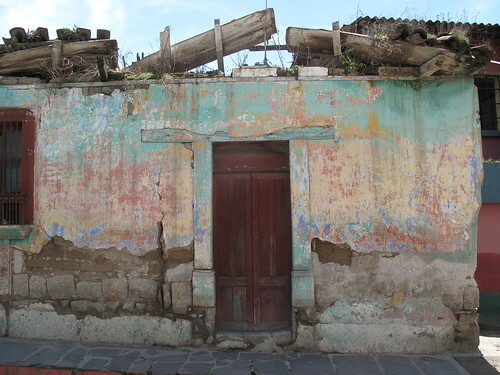 You can see all my photos of Xela here. I’m rubbish with money. Really rubbish. For years I was stupidly in debt, a situation that wasn’t helped by firmly sticking my head in the sand when it came to dealing with any financial matters – for example, I never used to even look at bank statements. When I phoned my bank and the machine insisted on reading out my balance before letting me speak to someone, I used to hold the phone away from my ear because I knew the numbers would be too depressing. I had no control over my spending, to the extent that one month I’d spent my entire salary three weeks before pay day and ended up living off scraps from the back of the cupboard. Over the years I finally managed to haul myself out of debt and save enough for this trip, but if I’m honest with myself it wasn’t really because I managed to get a firm grip on my spending, but because I worked my arse off to earn more money which was what basically made all the difference. So when it came to planning my trip, the think that worried me most was not getting mugged, or getting ill, or dying in a bus crash caused by crazy central american bus drivers (turns out that was what I probably should have been worried about). I certainly didn’t anticipate needing to worry about getting caught up in the outbreak of a pandemic in my first country or in a potential coup in my second (more on that in a future post). No, my major worry was staying within my budget of $50 per day for the year. Now that the first country is out of the way, how did I do? Well, the good news is that I managed to stay within budget – by all of 96 cents. Considering my normal spending habits, that’s definitely something I’m pleased about. In fact, it could have been a fair bit lower. Firstly, transport costs really bumped the total up. I knew Mexico was big, but didn’t really appreciate quite how huge it is. In particular, my decision to go massively out of the way to head right to the north of the country to visit the Copper Canyon (and then all the way back nearly to where I came from) added a huge amount to my transport costs. Also, the swine flu outbreak necessitated an unplanned internal flight to avoid Mexico City. Together, these two things made up nearly $8 out of that $49. Furthermore, I also overspent a fair bit in my first few days in Mexico City & Queretaro while I acclimatised to my new spending regime and got a feel for what was cheap and what was expensive – for example the hostels I thought were cheap in my first two stops ended up being around double what I ended up paying everywhere else. I also spent a lot more on food and drink in the three weeks I was travelling with friends from home than I did when I was just hanging out with other backpackers. I also found it interesting to note that the mere act of recording my spending has helped me spend less as I have a much better feel for where all the money is going and what’s expensive and what’s not. The bad news is that, even though I knew Mexico would be one of the more expensive countries I visit (as it’s one of the richer ones), it certainly won’t be as expensive as the 5 or so weeks in total I plan to spend in the USA, Australia & New Zealand. Easter Island will be very expensive too. So the average of all the other countries needs to work out a fair bit cheaper than $50 to account for them. Hopefully I can make that up over the rest of my time in Latin America (luckily that seems to be the case in Guatemala so far). 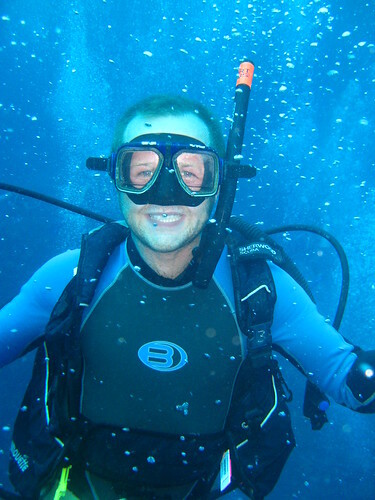 But ultimately I’m not going to let it worry me too much – as well as my budget I have other savings that can act as a cushion if I do overspend, and I’m not going to let money worries spoil the enjoyment of this trip of a lifetime. Plus I need to remind myself anyway that the point is not to do this as cheaply as possible, but to the budget of $50 a day, and so far I’m safely within that. Right, preamble out of the way, the geek in me will now delight in spelling out exactly where the money went and a few other numbers as well. Injuries & ailments: 4 (scraping my arm tripping over a pavement on day one, gashing my back on a jagged rock after overbalancing while crouching down to take a photo of an old VW Beetle, a bout of the trots brought on by a dodgy taco – thank god for Cipro – and a big allergic reaction to Mexican soap, also on day one, which was particularly troublesome considering the official advice for avoiding swine flu involved washing your hands regularly). In case you missed any, you can find all my Mexican photos here and read all my posts from the country here. And if you want to subscribe to catch future posts, you can click either link on the top right of this page to either do it in an RSS reader or get updates via email.